Daffron & Associates, Inc. offers application software and services for the utility industry. They serve over 150 utilities and 3.65 million consumers across electric, water and gas utilities in many states and countries. With emphasis on robust application functionality, leading-edge technology, enterprise integration, and outstanding service, Daffron provides a complete solution for the information technology needs of their customers. In response to utility market demands, Daffron developed plans to transition from a CIS product vendor to an enterprise solution provider. This required a strategic solution, based on an open technology strategy and one that enabled enterprise integration. This plan led them to rewrite all of their existing applications and provide tools that allow customers to integrate third party applications. This new enterprise solution was branded Integration X Platform (iXp) and represents Daffron's next generation thinking. Daffron used PlanetJ's Web Object Wizard (WOW) as the framework for much of their iXp suites of utility focused applications. By using WOW to rewrite existing applications and develop new ones, Daffron has saved many hours of development time and completed the new software much faster than using traditional coding methods. PlanetJ staff has been working with Daffron developers in customizing their WOW applications. Bruce Jones (senior developer at Daffron & Associates) has been involved with leading a good portion of these projects. "In our business relationship with PlanetJ, we have been able to provide a suite of applications to our clients in a very short time frame with added functionality over an existing product line. The WOW framework has allowed us to focus on the business problems and not with technology problems." 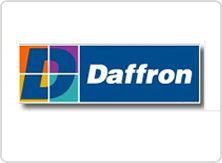 It was essential that the iXp solutions help Daffron customers achieve an integrated operating environment and enable existing software to synthesize with non-Daffron applications. Due to WOW's flexibility and platform independence, this was an easy task to match. Using this open strategy, utility customers have the choice of databases, operating systems, and hardware platform in which to deploy iXp. As stated by Paul Kluba (Chief Operating Officer of Daffron & Associates) "PlanetJ has provided Daffron & Associates, Inc. with a development environment that we feel positions us for the future very strongly. PlanetJ and the WOW tool have allowed Daffron & Associates, Inc. to move into the JAVA world from RPG in steps, rather than a complete rewrite. The support we have received has been top notch. We've had access to great staff and a world-class product allowing Daffron to exceed our customer's expectations for our next generation of software." CISiXp: This suite of Customer Information applications includes consumer accounting & billing, cash drawer, miscellaneous accounts receivable, outage tracking and reporting and others. FMSiXP: This suite of Financial Management applications provides customers access to robust accounting functionality – general ledger, accounts payable, payroll/human resources, fixed assets, payroll, others. MMSiXp: This suite of Materials Management applications offers software tools that support work orders, units-to-material, inventory and transportation. ToolBoxiXp: This suite of enterprise integration tools are based on a Service Oriented Architecture (SOA) utilizing SOAP, XML, WSDL, and Web Services and enables customers to integrated third party applications. By providing utility customers leading edge, open strategy software solutions, Daffron & Associates continues to be a leader in their industry. PlanetJ's WOW Enterprise Edition is the foundation for iXp and allows Daffron to be quick to market with a next generation solution. "The flexibility of the WOW framework has allowed us the luxury of our rewrite in stages - rather than jumping right into a huge JAVA project that would have taken years to complete. WOW enabled us to provide a higher quality product, faster time to market, and overall application satisfaction for our customers. We currently have several projects in the works with PlanetJ and envision more over the next few years. The technical expertise we have received is invaluable." ~ Bruce Jones, Daffron & Associates, Inc.